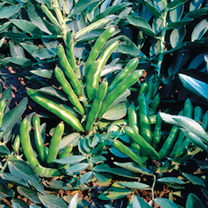 Aquadulce Claudia is an early maturing bean with long pods and high yields. 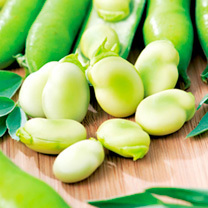 In our opinion, the best broad bean variety for autumn sowing to harvest late the following spring. RHS Award of Garden Merit winner. An autumn sowing variety. 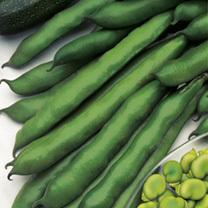 This superb, early-maturing variety grows well in low daylight conditions, producing bountiful crops of 15cm (6) long pods filled with 5-7 tasty, creamy-coloured beans per pod. 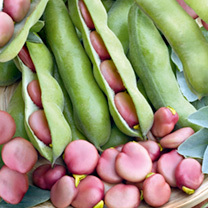 Colourful pink/rose seeds characterise this improved heritage broad bean. 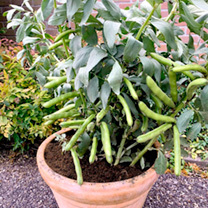 Compact plants produce small, upright, easy-to-pick growing pods in profusion. 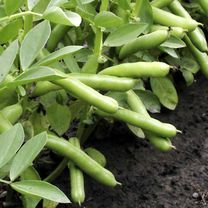 On our trials, visitors loved the taste of this heavy-cropping variety.